A good old friend is one whom you could call when you're outside hungry but with no dinner partner and she would rush down to the neighbourhood mall just to have dinner with you. 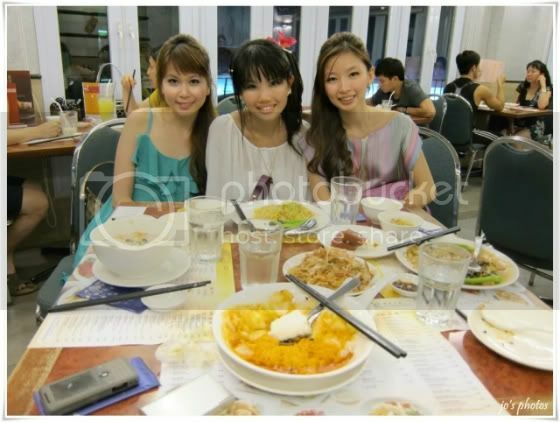 A good old friend is one who would go to cheap coffee shops that serve local dishes like roti prata, chicken rice, prawn mee and the likes just because you feel like eating them or to more expensive cafe and restaurants just because after a week of hard work, you feel like spending more on yourself for a good dinner spread. A good old friend is one who would rush down in her T shirt and shorts with her glasses on just to spend time with you coz she doesn't care if you care how she looks as long as her company soothes you. Tiffy my first friend in Primary 1, cheers to 22 years of friendship. A good old friend is one who has telepathy with you. Old friends are those who even after long periods of not meeting, would pick up where they left off. Old friends are those who welcome a new member and treat her like she's an old friend. 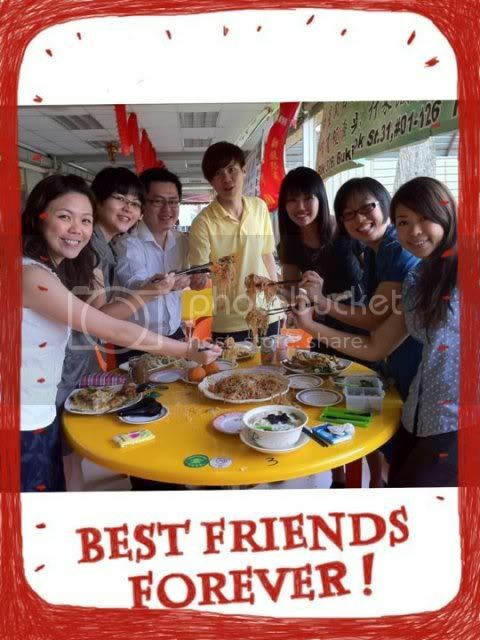 I'm so glad to know this bunch of kh's old friends. Since I was together with kh some 10 years back, I would always join him for any gathering with this group of his friends from schooling days. Even though we may not be close and were from different schools, they treat me like I'm part of their clique and made me feel welcomed. The most welcomed feeling I ever got from them was when they were planning to go on a short trip together this year and after kh told them he would not be around during that time, they immediately turned to me and ask me to go even if he wasn't going. We had such great fun playing games last Christmas that Karen decided to hold a games night at her place again one Saturday. First. 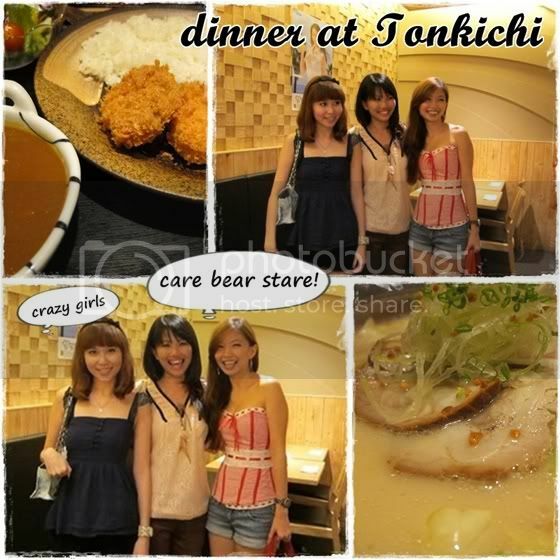 we met up in the east for some Japanese dinner at Tonkichi. We ended up reliving our childhood days and comparing notes on all the cartoons we had watched back then and the toys we played with in the 80s and 90s. There was even a point of time when you could hear us singing tunes like "Denver the last dinosaur", "Captain Planet. He's the hero. Gonna take pollution down to zero." and "Care Bears Stare" amidst many more tunes and jingles. I think it was more of Karen, Ethan and I singing while Regina and jw looked at us eyes wide with bewilderment. Note: Karen and I were really saying "Care Bears stare" up there while I supposed Regina's thought bubble read "crazy girls". After dinner, we were supposed to drop by Sushi's place to visit her and her cute little Leo (my distant nephew) but alas she wasn't at home so we headed straight to Karen's place for Games Night. Before we started playing any game, Karen decided to serve us some creme brulee that she had made. Unfortunately, the bottle of gas refill she bought did not fit her chef's torch and she was not able to caramelize the sugar coating on top. 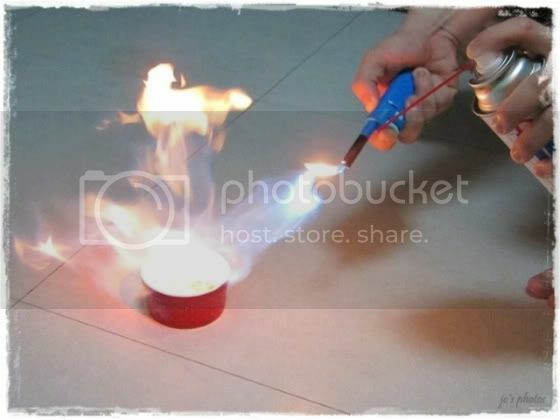 Quick-witted and highly daring Ethan improvised on the spot with the stove lighter aiming it onto the path of the gas. Check out the flame below! I was actually feeling scared for him. Even their dogs Louise and Emmie sat up and watched the whole scene intently. Poor Ethan burnt off the hair on one of his fingers while he was at it and we decided we should not allow him to "torture" himself just for us to savour creme brulee. Thus, we shared that one caramelized creme brulee out of the many that Karen had made. 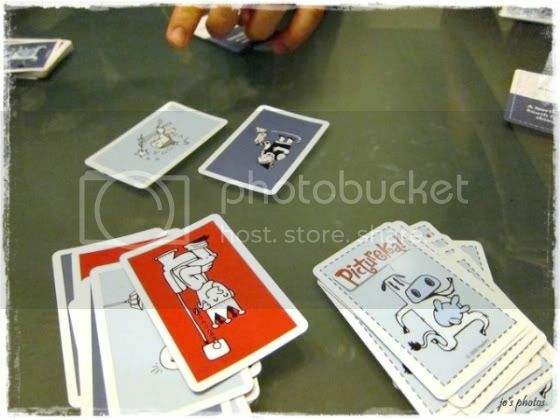 We played this really silly and crazy game called Pictureka. You could tell how crazy it is from the illustrations which reminded me deeply of the crazy stupid show Cow & Chicken which aired on Cartoon Network some ten years back. 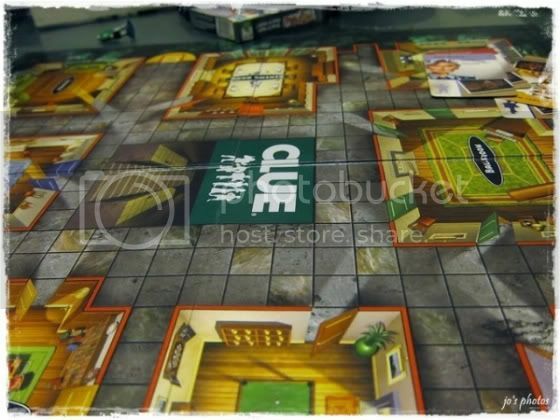 The ever suaku me had never played Cluedo before (yeah yeah I know, what happened to my childhood right) and so I was yearning to play it that night. 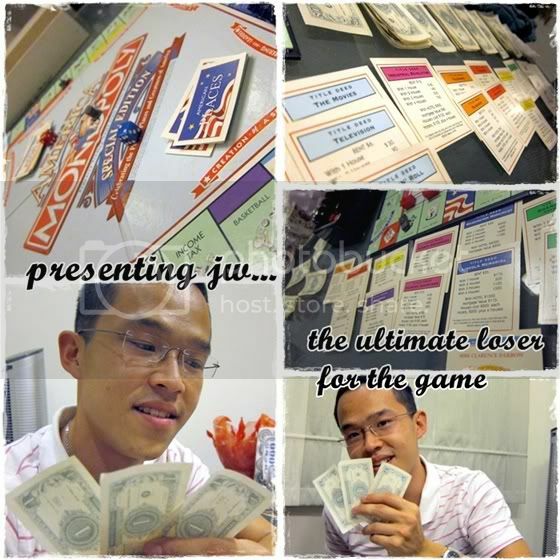 The final game we played was Monopoly. 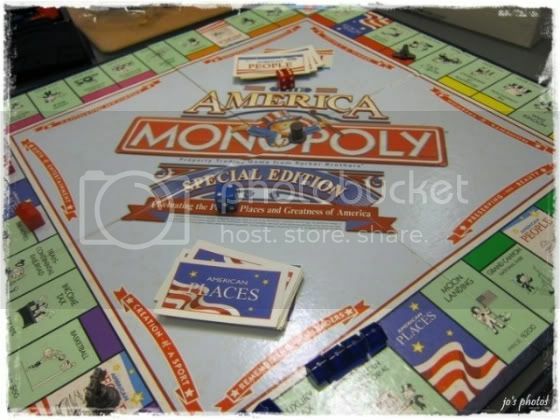 Regina was supposed to bring her Monopoly card version but it slipped off her mind and so we played the traditional old school board version which Regina and jw absolutely dislike since it was a pretty no-brainer-luck-and-chance kind of game. Luck and chance it was. We finally decided to pair up to combine resources as the game was getting no where in circles. Based on the matching of colours, Regina and jw formed a team while Karen and I formed another. Thanks to jw's greed, he became the ultimate loser and dragged Regina down while Karen and I kept collecting wads of cash. Top right picture shows Karen and my title deeds and cash while it is clearly evident that jw was the ultimate loser with $3 left. 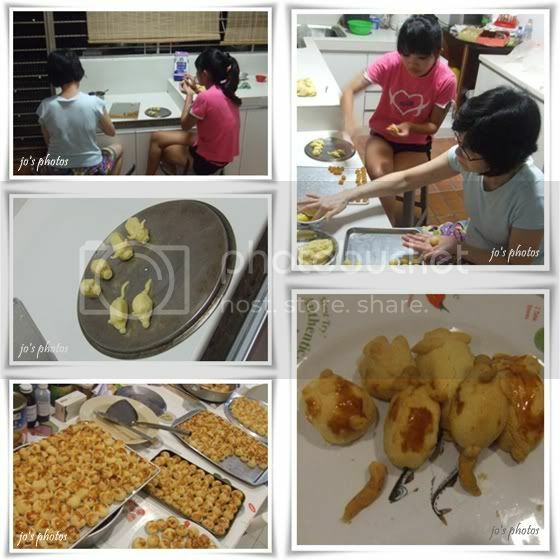 While we were playing, Karen and Ethan played the good host by fattening us up with lots of snacks and quenching our thirst with tea and a delicious lychee wine from Switzerland. We played and chatted till about 5am before we called it a night. It seems like we never ever leave Karen's house before 5am. 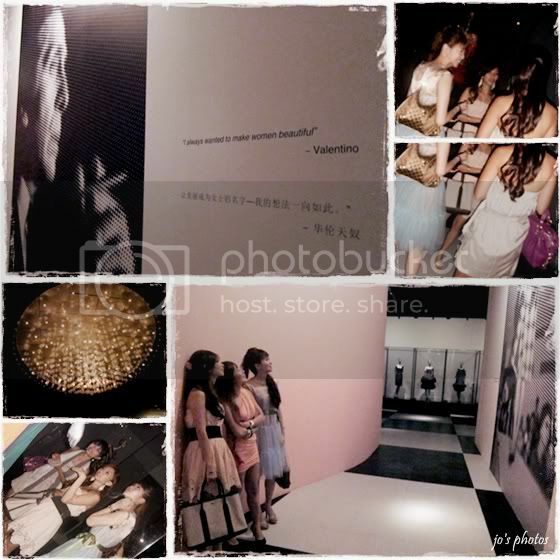 Sometime during the Chinese New Year period, Regina, Karen, Karen's sister Janice and I went to a curated fashion exhibition – Valentino, Retrospective: Past/Present/Future. Clara was supposed to go with us but she could not make it in the end and hence Janice took her place. 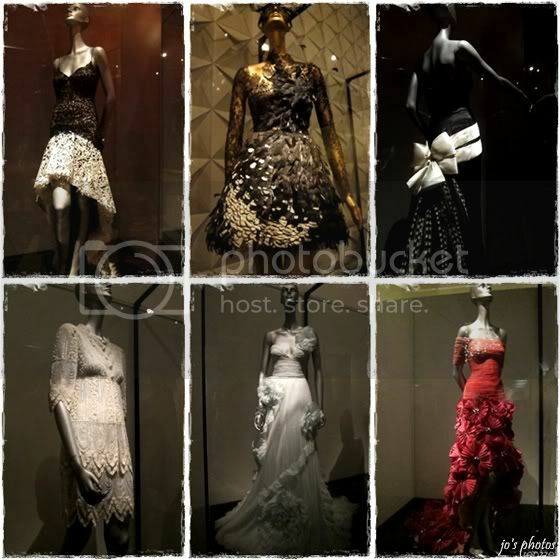 Held at the Resorts World Convention Centre, this exhibition boasts one hundred haute couture pieces from Valentino. These include works from early days of Valentino Garavani to contemporary designs by present Creative Directors Maria Grazia Chiuri and Pier Paolo Piccioli. Valentino Garavani is a household name synonymous with dramatic, opulence and extravagance. He made his mark early with intricately detailed, luxurious gowns and tastefully body-conscious silhouettes. He also perfected his own shade of red when he came up with a line of brightly-hued red dresses. This was later coined by the fashion industry as “Valentino red”, and became his signature colour. The pictures you see in this post were taken from Regina, Karen and Janice. Thank you so much for the pictures! 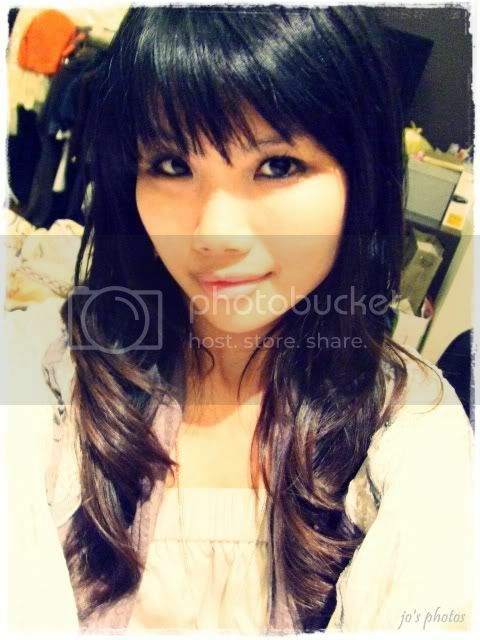 I was still using my pink bimbotic camera at that time which was fast failing on me after a few years of loyalty. Hence, whenever I go out with Regina or Karen, I would simply keep my camera and let their canon S90 do the job. I would love to have snapped more pictures but here are some of the pieces which caught my eye. I really love the black and white combination (this explains my white and black wedding gown!) 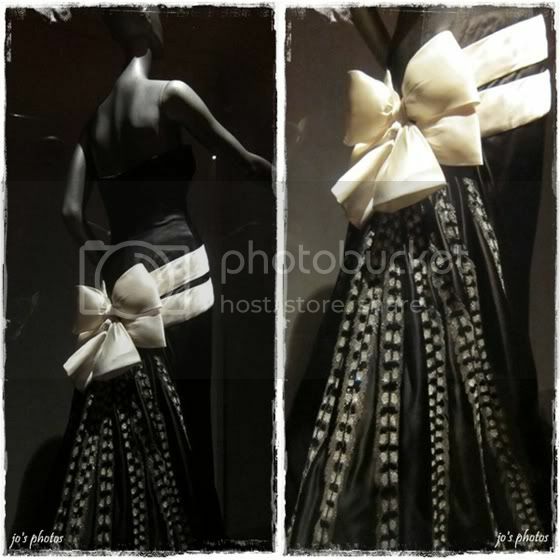 and I especially love the white bow at the back of this gown. Also on exhibition were pieces worn by classic actresses like Elizabeth Taylor, Audrey Hepburn and celebrities of the present like Cate Blanchett, Julia Roberts, Jennifer Aniston, Lucy Liu and more. 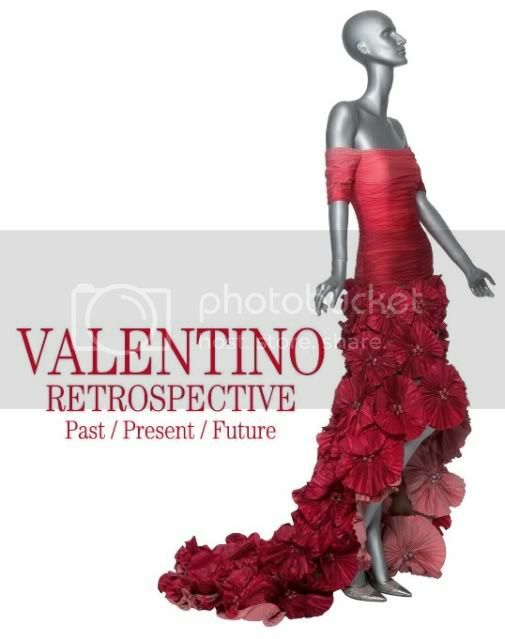 Valentino's most famous client would be Jacqueline Kennedy, wife of the 35th President of the United States, John F. Kennedy. There were simply too many gowns which were such a visual feast. Here, I've included this youtube video of the exhibition where a lot more gowns have been featured. 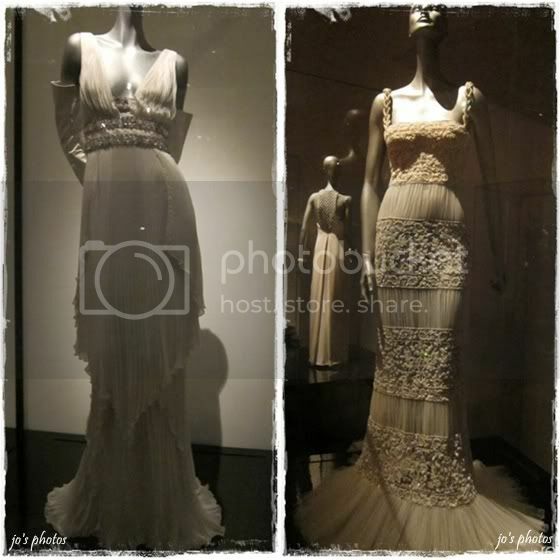 Here are my two most favourite gowns. Do you see the similarities? These reminds me of dresses that Greek goddesses and beautiful nymphs would wear. I love the picture of the 3 lovely ladies at the bottom of this collage. They looked really amused by the pixels forming a clear picture when seen from afar. Learning more about Valentino from the milestone board. Being very bimbotic fashionable, we decided we should wear dresses to match the theme of the exhibition though it was rather spontaneous that we all wore varying shades of pastel colours. We only realised how colourful we looked when we took this photo. No wonder everywhere we walked outside of the exhibition, people turned to take a second look at us. Most of the people there were clad casually as they were there for Universal Studios and lounging about the island resort and we probably look like OTT aliens on the island. 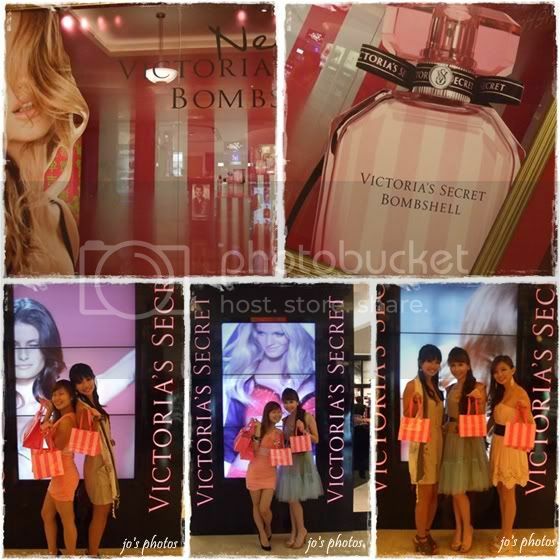 After the exhibition, we went to Victoria's Secrets where we each bought something. This is the first time Janice went out with Regina and me together and she was really so excited snapping so many photos. After that, we headed to Dustbunny Vintage where I spent a bomb on a few pieces of beautiful vintage dresses and one-off pieces. I guess we were truly inspired by the many beautiful and fashionable gowns we saw in the morning. I like how Janice edited this photo. 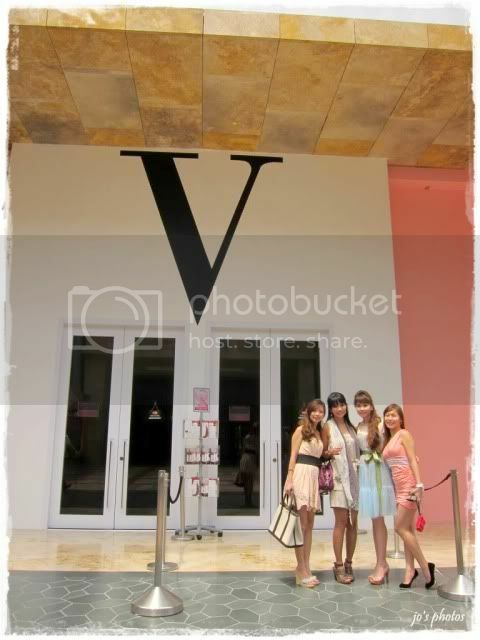 It reminds me of a section of ViVi magazine where the photos have got a vintage washed out tone. 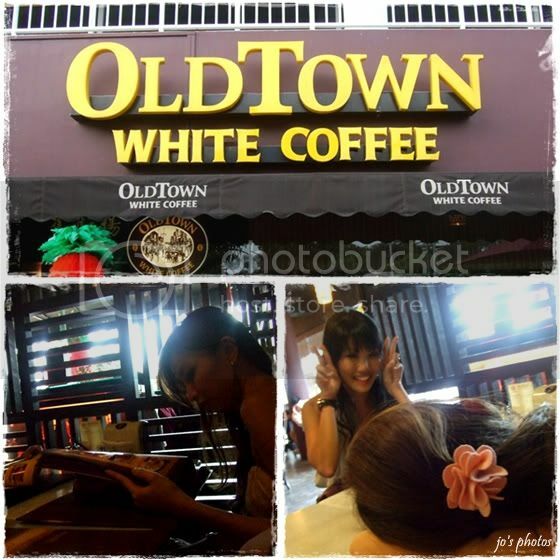 After shopping, we finally settled for tea at Old Town White Coffee where Regina left us for a date with the hubby while Clara joined us. 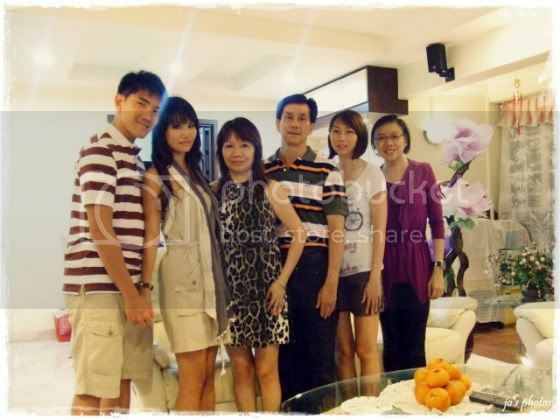 My final stop was a CNY home-cooked dinner with my family. I absolutely love my mum and dad's cooking. Yes, my dad can cook very well too. He learnt it from my grandmother and my mum. 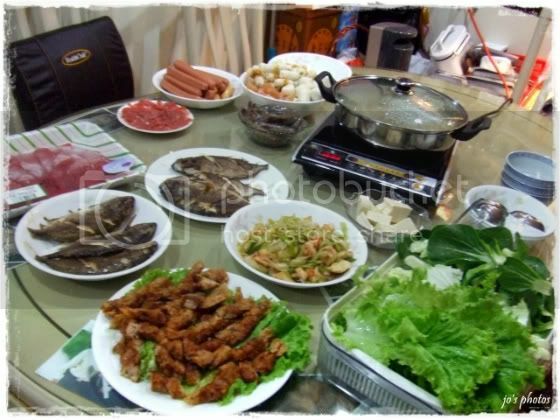 Now, I wonder if kh would be able to cook for the family next time too. 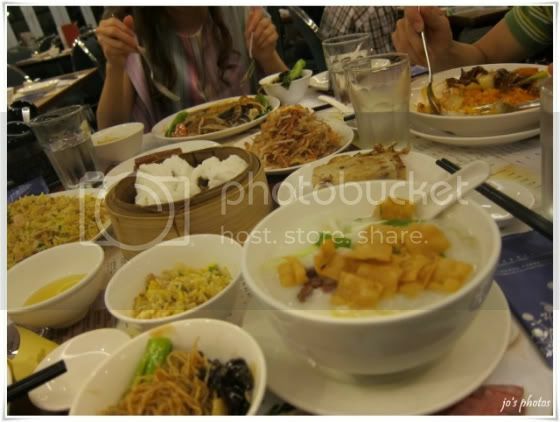 There was steamboat where the soup stock was pig's stomach soup. I really love my parents' pig's stomach soup and my mum's ngor hiang as well. She makes the best ngor hiang ever. It would always be dish which my relatives would wait for every reunion dinner. A family portrait where we were all standing awkwardly. Maybe we should invest in a tripod... and an SLR probably. I'd wanted to snap a more proper one but my camera died after that. 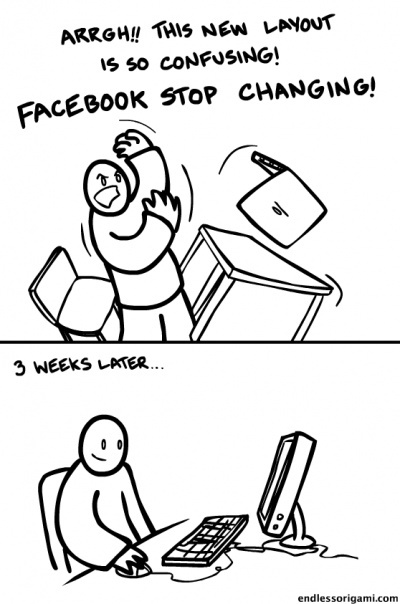 I really hate the whole new Facebook "facelift". Absolutely whining and bitching about it. But hey. I'm still using Facebook every day. For today's site of the week (SOTW), I would introduce to you not Facebook but Failbook. 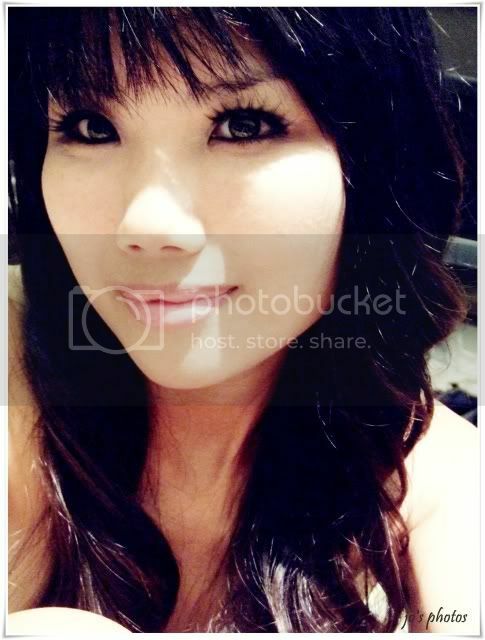 This site features some of the most hilarious status updates, replies, photo comments etc on Facebook. There are so many things that got me laughing at my laptop screen and one such example posted yesterday was by someone called Rick. "I have all my FB email settings turned off to avoid getting mail from them. This morning I received TWO emails from FB telling me that they'll be sending me less mail." Writing a backdate post in September when all the leaves are withering in the upper hemisphere about Chinese New Year which happened in February where all the flowers were blooming happens once in a blue, pink and purple moon on other blogs. Over here on Jo's Jumbled Jardinière, it is as common as missing the bus just when you're running late. It's been so long so get ready for lots of photos. This year's springcleaning included cleaning up both my current room and the room in my maiden home. The room in my maiden home had been left the way it was since my wedding and I had been very lazy to clean it up even though I go back home twice a week. My family had conveniently declutter the living room by cluttering my room and it was fast becoming a storeroom. So anyway on that day, I was greeted by lots of knick knacks on the dining table as my parents were also decluttering their mess. This musical box is older than I am. It produces tinkling sounds with no particular tune upon winding. I remember using it as stage for my toys and in my little cognitive world, this ballerina was supposedly a famous ballerina who had come to Toys Town to perform. 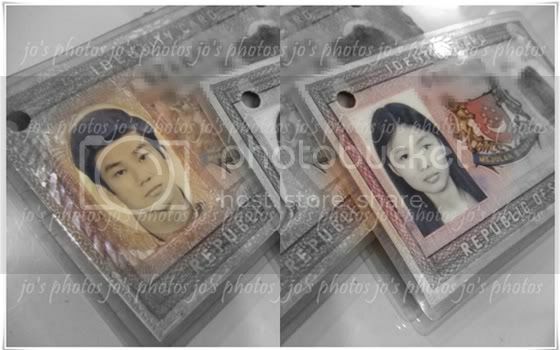 My parents old identity cards, together with lots of passport-sized photos were strewn all over the table. Don't you think my parents look so handsome and beautiful? 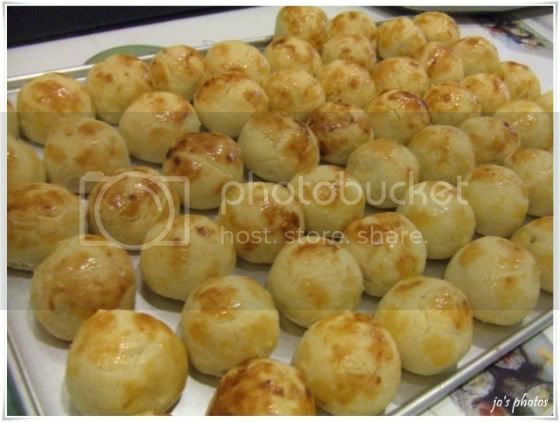 Back at home, I helped my mother-in-law to make pineapple tarts. She was the only one making while all the BOYS in the family only knew how to eat them in batches. Seeing how unhelpful the boys in the family were, I volunteered to help her by inserting the fillings and rolling the pastries. I missed out the part in the day when she was making the filling from scratch. 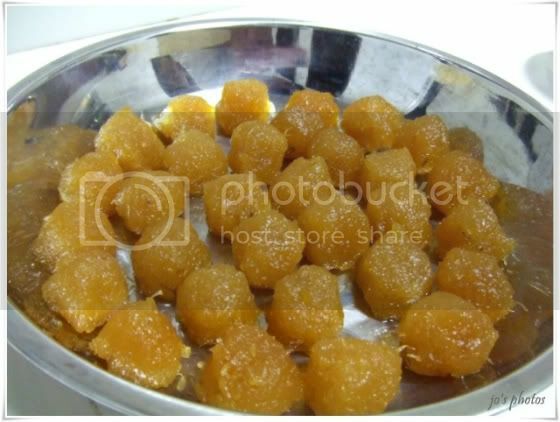 I heard that it is the most back-breaking part of making pineapple tarts. We baked them in batches since my MIL used the microwave oven which did not have racks like conventional ovens. I know that the shapes and sizes aren't exactly standardised but they taste delicious. I was also experimenting with different amount of fillings and different ways of rolling the pastry which accounted for some of the ugly ones up there. We slowly made them smaller such that you could just pop them into your mouth without choking from the crumbles. As mentioned in one of the recent post, I said I would feature Clara's work of art on my stubby fingers with short nail beds. She could really do wonders to my sort of ugly nails without using fake tips or acrylic extensions. 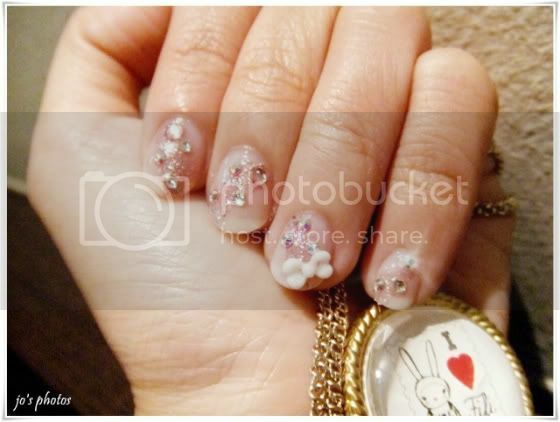 So what you see are cute 3d bows and crystals on my real nails and she did them with such speed and precision. I'm amazed at how fast she finished my nails while the other manicurist was still sticking crystals on a lady beside us who was there earlier. And yes, I made pineapple tarts the very day I did my nails. Nobody chewed on any bow or crystals of course. 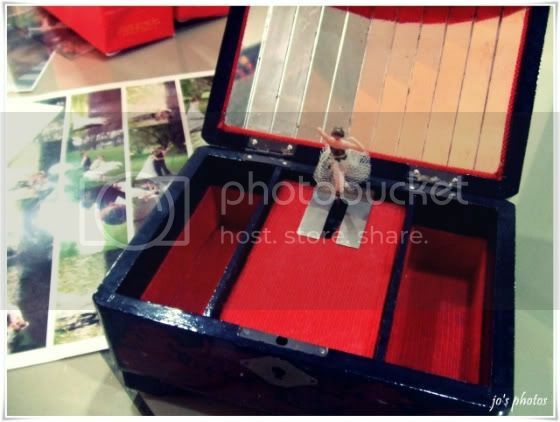 You could view more of Clara's work on her blog. 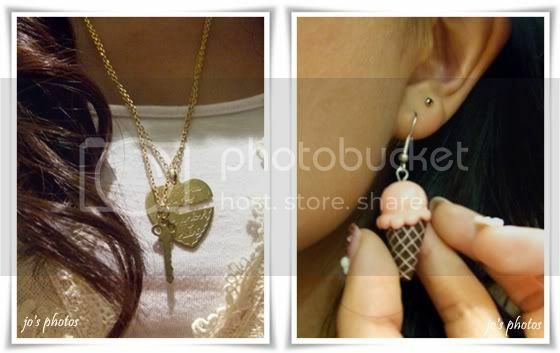 Just click on the gallery and navigate from the different categories. Day 1 was spent visiting all the elders from my side and mainly the kh's side of the family.We went visiting at many of his distant relatives' houses that I got quite confused by the time we reached the last house. For make up, I tend to focus a lot on my eyes. I tried this super drama lashes which I didn't quite like as you could see I look like Snuffleupagus from Sesame Street. I'm not sure if it's obvious but I pasted tape for deeper crease so that it is easier to apply my Maybelline eyeshadow to create a glittery smokey eye effect. Lower waterline is lined with Koji Springheart retractable crayon pencil liner. I further rimmed the lower lash line with a glitter white pencil from Sasa. I completed the whole look with greyish green contacts which were rather subtle. On my skin is Dr Young BB cream and I've since stopped using foundation. This sums up my look for Day 1. Day 2 was more relaxed as we spent most of our time watching TV at just one family's house on both my side and his side each. My little cousin came to me and plonked her hamster onto my palm. I love what my mum did to this fake tree. This tree used to have those plastic orangey autumn leaves. It got very old and the leaves kept dropping. Lots of the leaves were plucked off by my cat back then when she was still around. My mother made use of the wrappings from flower bouquets to create the 3 big "flowers" you see below. Hand that creativity award to my mum already, will you? All the flowers outside my maiden house were in full bloom. That's my 2nd sis by the way who got a lift home from us while my happening parents and eldest sis went to other parties and gatherings of their own when it was already past midnight. There is a missing thought bubble at kh's head which says: "Why did I agree to my wife's request of taking pictures with fake flowers?" My make up was pretty much the same as Day 1-- the drama mama eyes. We finished most relatives visiting by Day 2 and so Day 3 was spent watching Green Hornet with kh's cousins. I kept my look simple so the only accessory I wore was my Tiffany choker. Because kh is such an irritant by doing a photo bomb on purpose, I shall post up this photo of his annoying face. That would teach him not to be annoying or his ugly expression would be posted up on my blog. I wanted to keep my make up simpler as compared to the previous 2 days and so I used my favourite and highly-utilised faux lashes which looked a lot more natural than the ones I've been using the past 2 days. I also skipped eye shadow and coloured contacts but continued to line my eyes as per normal. The photos you see below were taken at the end of the day so the make up isn't freshly applied. 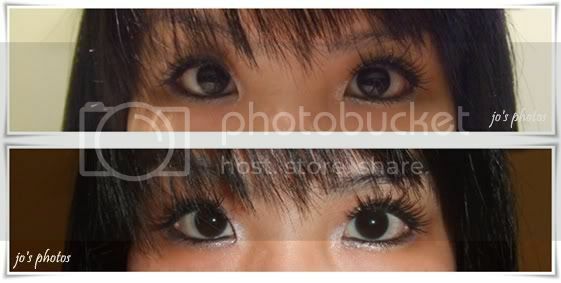 I really love the effect of this cheap no brand lashes but I can't seem to find any with similar effect and hence kept re-using this pair. 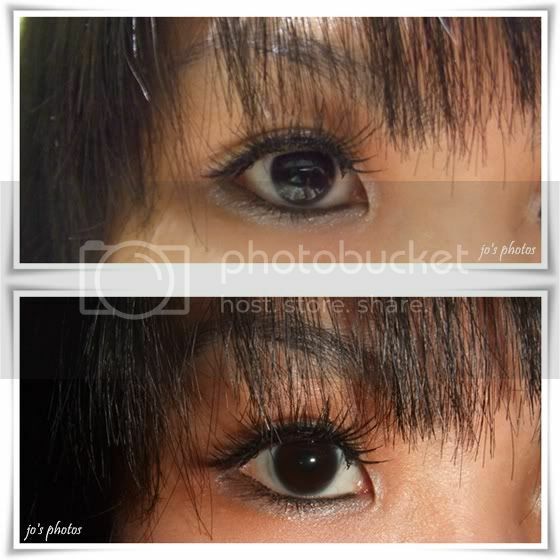 I should check out Dolly Wink soon but I find their lashes not as natural too. You could see that the stem of the lashes on the right (meaning my left eye) has been stained by lots of glittery eyeshadow and its shape is a little off. It's high time to throw them away but I'll continue to keep them till I find another pair which produces the same effect. You could also see how obvious the tape look when I close my eyes without blending in any eyeshadow that day. 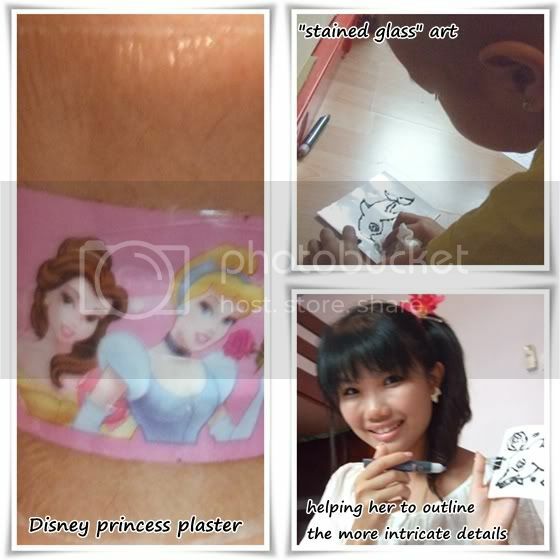 I'm still trying to master the art of pasting tape which appears invisible. I'm really amazed at how my wedding make up artist did it. 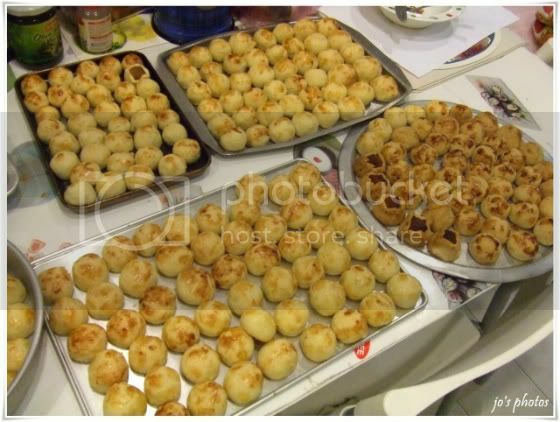 There was still quite a lot of pineapple filling left so my MIL kneaded some dough and we made pineapple tarts again. This time till 6am. 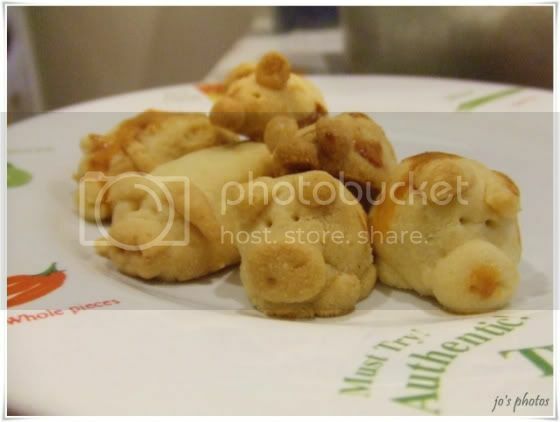 I'm one who hates doing repetitive stuff so I decided to mold a pig out from the dough just for fun. My MIL was so amused by my pig that she asked if I could do the 12 zodiac animals. lol... It was rather difficult due to the dough's soft consistency and so I could only managed pairs of pigs, ox and mice. I had wanted to make rabbits since it's the year of the rabbit but their ears just wouldn't stand up. The animals look a lot better before baking. After baking, the horns of the ox went down, the tail of the mouse broke and the pigs snouts had got no nostrils. I tried to test my youngest brother-in-law to see if he could identify all the animals I made. He initially thought the oxen were the father and mother pigs while the pigs were the piglets. Fortunately after some prompting, he got all correct and as a reward he ate the pigs. He deemed the pigs cute and asked me to make more of them. I asked if he wanted to chip in his effort and he conveniently excused himself. 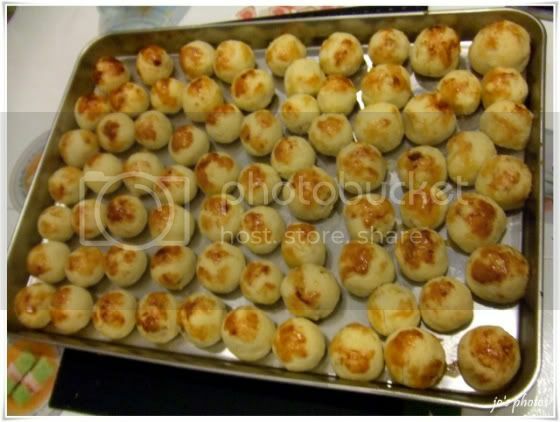 I told kh to help me take some candid shots of my MIL and I making pineapple tarts and he took a video instead. Traditionally, there are 15 days of CNY and so during this whole period, Chinese would still go visiting even though there is only 2 official holidays in Singapore designated for CNY. Day 7 is known as "ren ri" (人日, literally translated to Human Day). 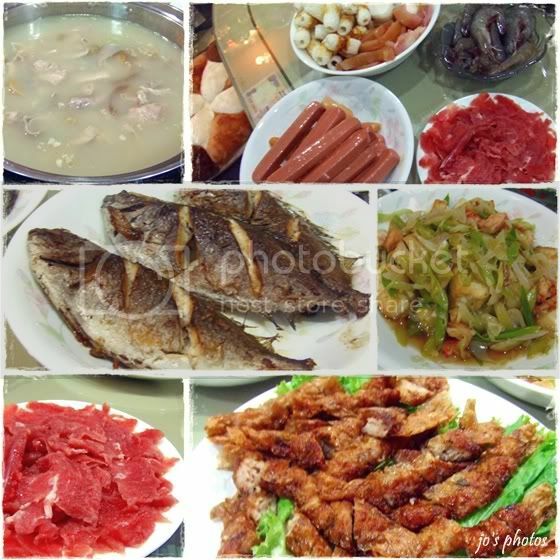 It refers specially to the 7th day of zhengyue (正月, the first month in the Chinese calendar). According to Chinese customs, ren ri was the day human beings were created. It is celebrated not only in China, but also other regions influenced by Chinese culture. It was a packed off day for me. First, I dropped by to visit Cyn mommy and my godkids. I took a long time to have a proper shot with the 2 cheeky monkeys while cyn took a hilarious video of the whole process. I shan't post the video here. I warned Jase not to drop any prawn roll crumbs on the bed and guess what happened? I was the one who dropped it when I plonked myself onto the mattress which tipped the opened jar of prawn rolls down. These were taken in February when Char was still mobile at that time though walking with difficulty. Jase was wearing Char's wig for fun and we thought he looked like a pretty boy. Char hasn't worn the wig yet as she's fine with her current state. Like most little girls, she used to be very vain and had her hair tied in all sorts of styles pre cancer days. Currently, she would be upset about her hair every now and then but generally she is fine with the way it is. We did some "stained glass" art. 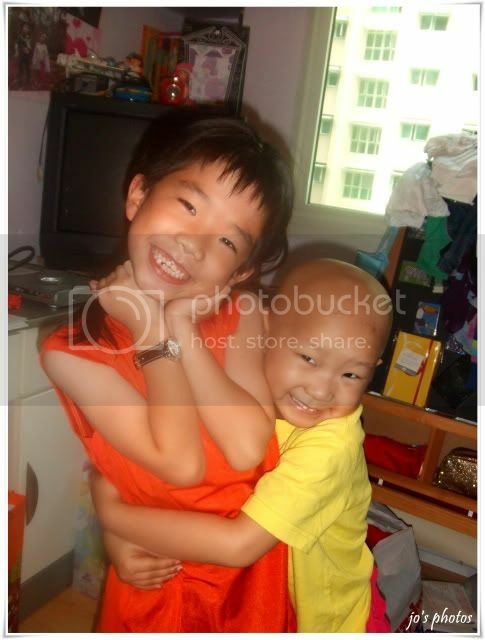 My 2 lovely and cheeky godkids are just too adorable. 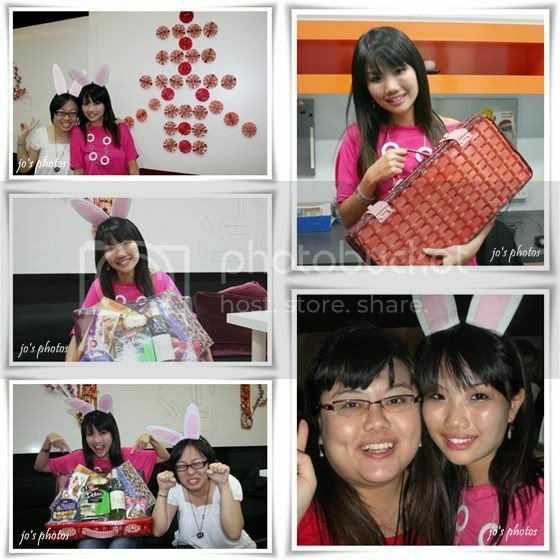 Charmaine is so sweet. She hugged Jase kor kor and said, "I love you!" I had to cancel my facial appointment to spend more time with the kids. After that, I rushed to meet Karen as we had to do some fitting to our altered dresses at Dustbunny Vintage. 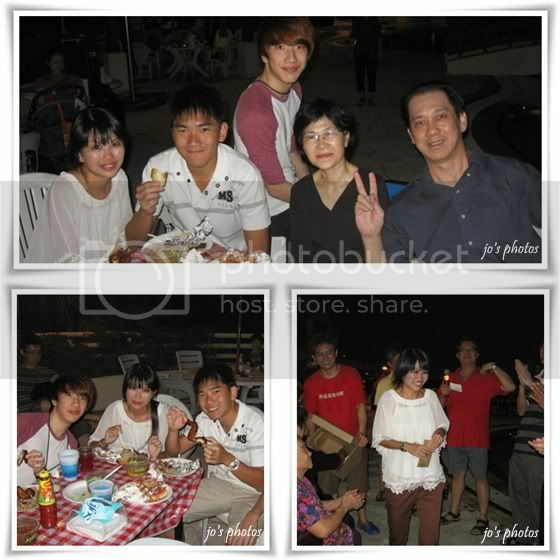 The day ended with a ren ri dinner at Holland Village Crystal Jade where jw and reg joined us. We ordered a little too much as we thought the guy in our group would be able to finish everything. Little did we know that all the girls could eat more than jw. lol... Ethan and kh ought to be around to help finish the food! The company's CNY celebrations was held really late on Day 13 this year due to the directors' overseas schedule. 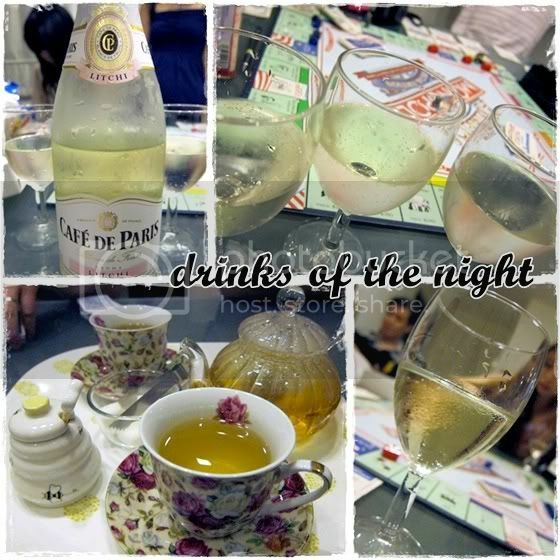 My group was in charge of this event and we had great fun playing guessing the Chinese sayings and some play doh game. I won a hamper in the lucky draw. I think it was the 3rd prize and I like it a lot more than the 1st and 2nd. 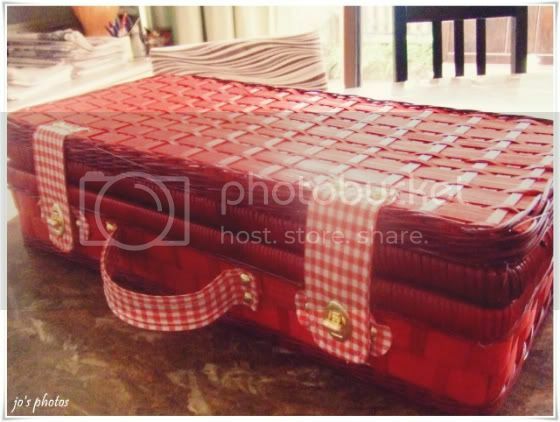 Even though the goodies in the hamper weren't as good as the top 2 prizes, I love the picnic basket that came with it. I was only interested in the basket so I opened the hamper on the spot and donated the items to my office pantry and carried the empty basket home. It looks like this after the goodies were emptied. 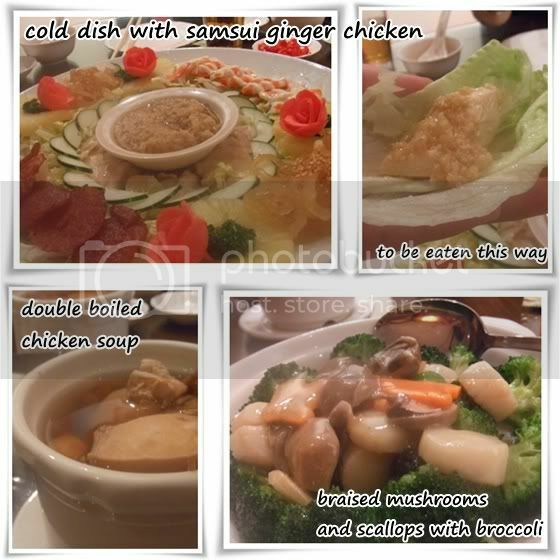 We had dinner at Soup Restaurant 三盅两件 with my family. 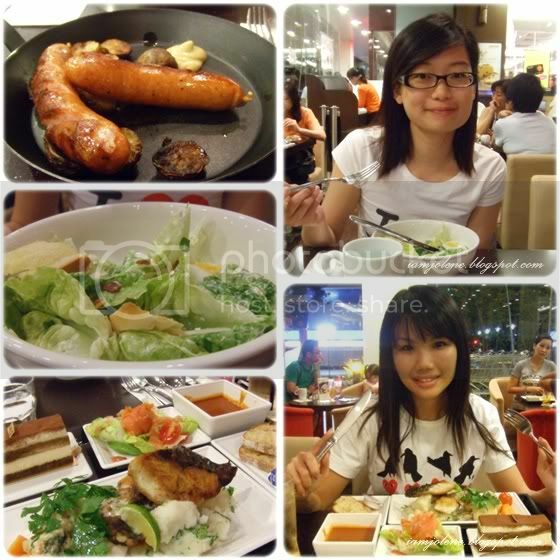 I've always loved the food there. 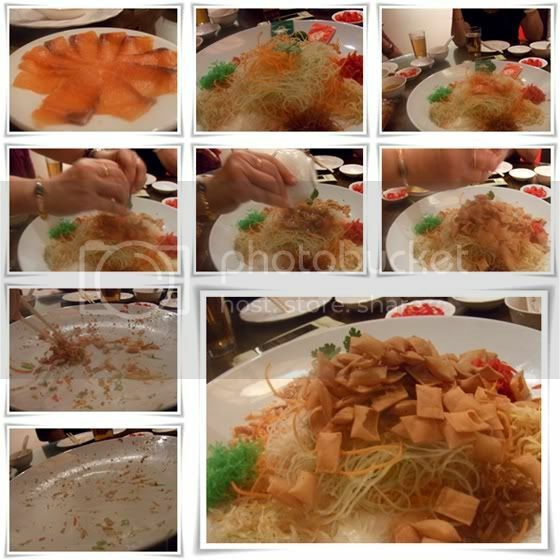 They had raw salmon slices for Yu Sheng. Salmon slices are fast replacing other raw fish slices in the recent years. I love to eat Yu Sheng and will never get tired of eating it during CNY. 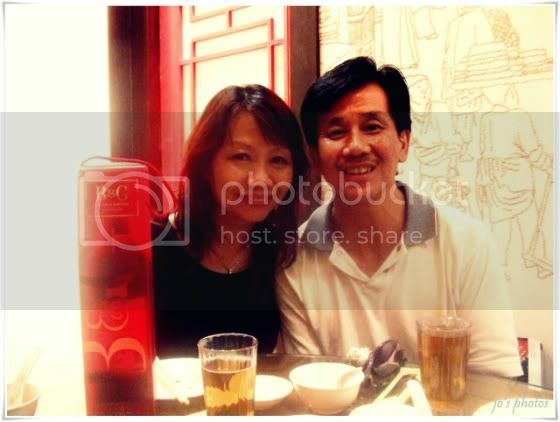 My gorgeous parents... Quick do a comparison to their IC photos which I posted earlier in this post. I can't recall when these had taken place as I got the photos off Facebook. My short term lunch kakis at work and I had vegetarian Yu Sheng during lunch one day. Instead of fish slices, jelly which looked like salmon slices were used. 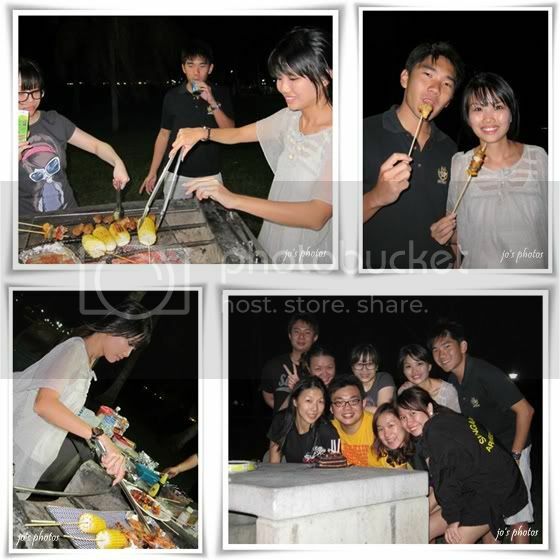 One of the Saturdays, we had a CNY bbq held at one of kh's distant relatives' place. We went at night after my work but in the day, games were played. 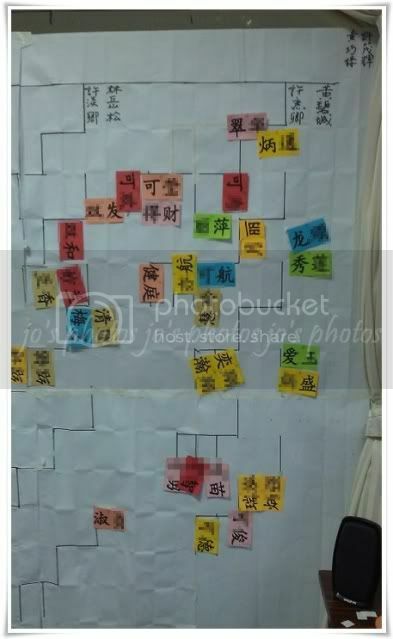 One of the games included matching all our Chinese names to the really huge family tree. Later on, kh's cousins related to me how someone from another family (distant relative) took my name slip and kept wondering who I was while our side of the cousins who knew me were rushing to place it on the tree. I've blurred some of the characters out. No, I don't want anyone knowing our whole family tree. I won an ang pow (red packet) in the lucky draw. Not too bad for a newcomer to the family.